Aruba is one of the countries comprising the Kingdom of the Netherlands, located in the Caribbean Sea near Venezuela. Aruba's natural bridge, made of limestone, was frequently photographed before its collapse in 2005. Aruba, located in the Southern Caribbean, is one of the four constituent countries of the Kingdom of the Netherlands. The island forms part of the ABC Islands. The citizens of Aruba together with other constituent countries form the Kingdom of Netherlands and share a single nationality. Aruba is characterized by a dry climate and cactus-strewn landscape and covers an area of 69.1 square miles. The small island has diverse attraction from beautiful sand dunes to large gardens full of butterflies. The nesting area for over 80 species of birds at Bubali Birds Pond offer perfect views for tourists visiting the island. The natural pool of Aruba is formed out of the outcropping of rocks which forms a pool as a result of volcanic activities. The natural pool is located in the remote areas of northeastern coast and provides a suitable swimming opportunity for tourists visiting Aruba. The outcropping rocks protect the natural pool from the oceanic winds which may displace its waters on a windy day with rough surf. The rugged terrain which surrounds the areas around the natural pool makes the access to the pool only possible by a four-wheel drive, horseback, or on foot. Hiking trail from the entrance of the park is a famous route used by those visiting the pool. 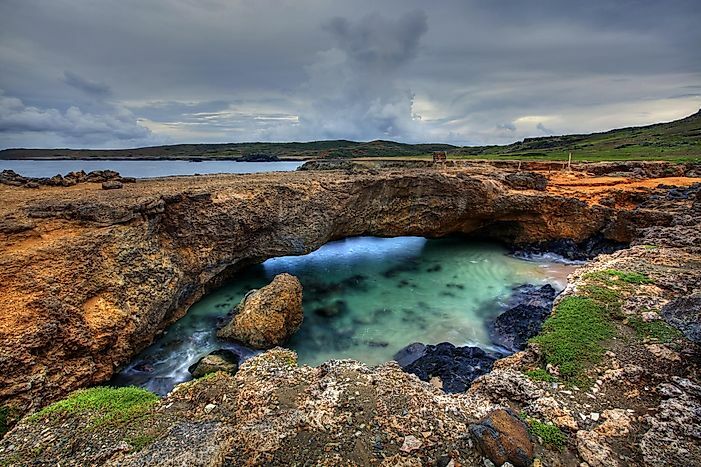 The natural bridge of Aruba was formed out of limestone. The bridge measured 25 feet above the sea and was Aruba’s highest and the most magnificent coral structure before its collapse on September 2, 2005. It remains Aruba’s most photographed area and the most visited on the island because of the ease of access. The natural bridge of Aruba offers a fantastic picnic and swimming site with the bridge acting as a protection from the crushing waves. The world’s second largest desalination plant, Spanish Lagoon, is located along the path that leads to the natural bridge. The California lighthouse is located on the northwest tip of Aruba near the Arashi Beach. It is named after the famous wreck ship which was named “California”. The lighthouse is Aruba’s scenic landmark offering a wide range view of the western coastline sandy beaches. A restaurant near the California lighthouse provides perfect lunch and dinner opportunities for tourists who visit the area. The restoration work on the lighthouse was carried out between February and May 2016 and involved the minor repairs and painting of the light house. The terrain around the California lighthouse is moon-like, characterized by sharp rocks sticking out of the ground. The Guadirikiri caves are located within the Arikok National Park, at the base of the limestone cliff. The two chambers of the largest caves are illuminated by the holes on the ceilings of the caves while the third chamber is illuminated in the dark. The caves contain Amerindian petroglyphs. A traditional myth has it that the daughter of an Indian chief was imprisoned in the Guadirikir Caves for falling in love with an unwanted man. The man was also imprisoned in the nearby cave but they managed to meet underground where they died and their spirits vanished. About 75% of Aruba’s GNP is derived from tourism related activities. The seven wonders of Aruba offer perfect attraction for tourists visiting the island. The majority of tourists visiting the wonders of Aruba come from the mainland Netherlands, the US, Venezuela, and Colombia. Dutch citizens do not need visas to access the Aruba beauties unlike tourists from other countries who must have passport.